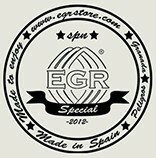 100% Natural products, handmade by EGR in Granada (Spain). EGR Cork Grease is made from 100% natural products with the best quality, ensuring the final product to be the best. It is designed to keep the cork of every instrument in optimum conditions from the very first day. This grease has countless qualities, since its main component is extra virgin olive oil. For EGR the most important is taking care of even the smallest details. For that reason, our grease has a fruity scent and a new, fresh and innovative touch, so using this product is now more enjoyable. This way it becomes a benchmarkhaving many benefits for both the instrument and the musicians. It is the first scented grease in the world made from 100% high quality raw materials. The extra virgin olive oil used for the grease is obtained in Andalusia (Spain), therefore it has its corresponding certificate of origin to guarantee its quality. The characteristic consistency of this product is achieved by using Anthophila natural wax, which is why it is unique and has the best quality.